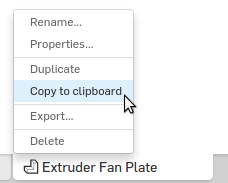 A useful feature of Onshape is revision history, allowing you to inspect or restore any previous state of your design. Reasonably enough, complex revision histories can easily inflate the storage size of your documents – especially if, like me, you learn by making a lot of trial and error modifications to your work-in-progress parts. Although I think the free plan is generous, it does have limits, so document size can become a concern. For example, here are the sizes of two designs of similar complexity. One is a buckle and the other is a fan plate. The latter is only slightly more intricate than the first (and very simple indeed by professional CAD standards), yet it weighs in at 75 megabytes compared to only 208 kilobytes. That’s useful data for a product or project where the provenance of each change is important, but in this case I know the revision history is mostly junk because it contains hours of doodling before I figured out how to achieve the final design. Next, create a new document. 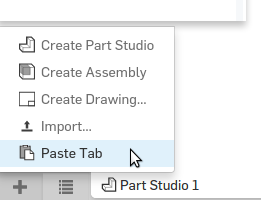 Click the new tab button and select Paste Tab. Now you’ve got the same part you started with, minus embarassing memories of mistakes made during its initial design. Size comparison: the fresh copy of that 75 megabyte design is only 1 megabyte. Posted on Sunday, September 6th, 2015. Tags: 3d.